I thought it was time for some pregnant belly body art. I’m a big fan of optical illusions so that was the first thing I thought of doing, eventually deciding to go with abs because I thought it would be funny. 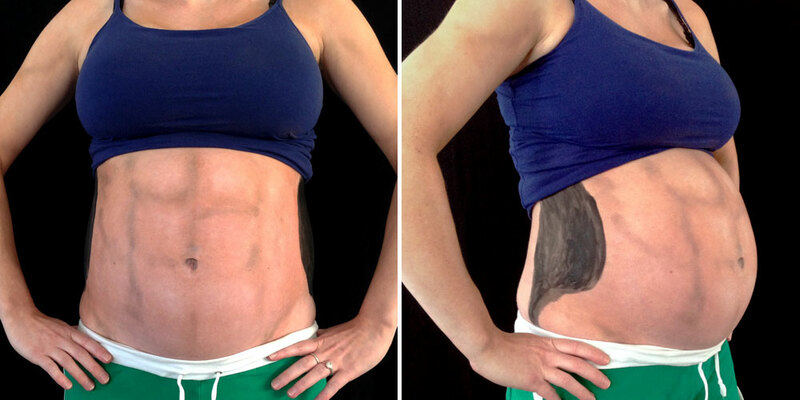 The abs themselves are done with powders in a few different shades. The black on my sides to slim them down is done with body paint. I’ve never tried anything like this before but it was a good lesson in understanding how important the exact view point is for making the illusion work. I originally started doing it by looking in a mirror but soon realised it didn’t work because the camera was going to be closer to stomach height. So I set up the black backdrop and tripod, marked where I would stand and kept taking photos through the process to see how it was looking. Not the most efficient way to do it as I kept having to go back and check. Luckily what I’d chosen to do didn’t need that much accuracy, the abs were just rough shading, it was only really the black on my sides that I needed the correct viewpoint for. If I ever try something like this again and the design needs more precision I would definitely try setting up the camera and have it feed through to my laptop so I could view it at the same time as painting.